99% Casino Match Bonus + 15 Free Spins Every Monday At Vegas2Web Casino! plus 15 free spins on todays hot slot. The minimum deposit amount to qualify for the 99% match is $30. The match will be redeemable on a single deposit up to $100, unless otherwise stated. Your match bonus is redeemable and may be cashed out. The deposit and bonus must be wagered 30 times before a cashout is permitted. claimed and is subject to a wagering requirement of 30x. This offer is only available to majority slot wagering accountholders. 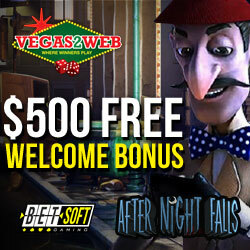 All bonuses are subject to standard terms and conditions of Vegas2Web.